Los Angeles, known for its extensive freeway system and broad boulevards, fast food, car culture, lawn-filled suburbs and smog, is getting serious about sustainability—and the effort includes local and sustainable food and agriculture. 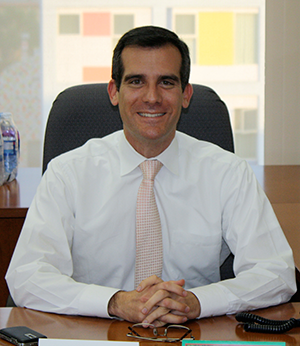 When Los Angeles Mayor Eric Garcetti took office, he created a Mayor’s Office of Sustainability and appointed Matt Petersen as the city’s first chief sustainability officer. Now, Los Angeles has a comprehensive sustainability pLAn. Many factors, including water conservation, livable neighborhoods and waste management, naturally intersect with food and agriculture objectives. In a city that used to be home to many orange groves and other farming operations, agriculture will have a strong role in the city’s sustainability resurgence. Los Angeles will make land at its public facilities (including the Los Angeles Public Library) available for urban agriculture as well as convert unused lots to gardening spots. Future plans include a pilot hydroponics and aquaponics program. The pLAn aims to encourage Los Angeles residents to purchase locally-grown food from farmers’ markets, and another one of the city’s objectives is to support a Good Food Purchasing Program to assist institutions such as hospitals and universities in sourcing locally grown fruits and vegetables. Other goals include expanding urban agriculture in the city’s Promise Zone (this land is federally designated) and spurring more urban farming efforts through the city compost giveaway program. Another objective stated in the pLAn is to improve soil health in the city through biodiversity strategies, and to initiate tree planting in neighborhoods that are most in need of new trees. In 2013, Los Angeles was home to 494 urban agriculture sites. The pLAn calls for increasing this number by 25 percent by 2025 and 50 percent by 2035. It’s also important to eliminate food deserts, a fact acknowledged by the pLAn, which stipulates a goal to expand the Neighborhood Market Conversion Program and to stimulate investment in new grocery stores through the FreshWorks Fund. The pLAn also seeks to create more grocery stores in underserved neighborhoods, require that all farmers’ markets in the city accept electronic benefits transfer cards, and to ensure that everybody in the city lives within half a mile of fresh food. Agriculture is only one aspect of green investment and the creation of green jobs in the city. City leaders hope to attract $100 million in such investments through the LA Cleantech Incubator and boost green investment in the city to $750 million by 2025. Of utmost urgency is water usage, which is not only important for agriculture but for the overall livelihood of the city. California is suffering through its fourth consecutive year of severe drought, and to combat this water shortage, Mayor Garcetti issued an executive directive with a goal of 20 percent per capita water reduction by 2020. In order to reclaim storm water for future use, the city is funding the cleanup of the San Fernando Groundwater Basin, which will make more fresh water available. Two pLAn objectives include cutting by half the purchase of imported water by 2025, and to locally source half of all water by 2035. Additionally, Garcetti has created a Mayor’s Water Cabinet. Also in the works are plans to replace 95 miles of water pipe infrastructure, expand a rain barrel program, increase the usage of permeable pavement, utilize more recycled water, and revise the building code to spur water conservation. Another ambitious vision outlined in the pLAn is for Los Angeles to become the first major city in the United States to achieve zero waste. Already, the city diverts over 75 percent of waste away from landfills, and is the largest city in the nation to ban single-use plastic bags. To this end, policy goals include the expansion of local organic-waste collection programs, anaerobic digestion facilities, and implementation of a waste franchise system that relies heavily on recycling. Due to climate change, the days of lush green lawns outside Los Angeles homes are numbered as grass uses precious water and gives little back in return. “We hope to get rid of ornamental lawns and put in more native plants,” says Petersen.